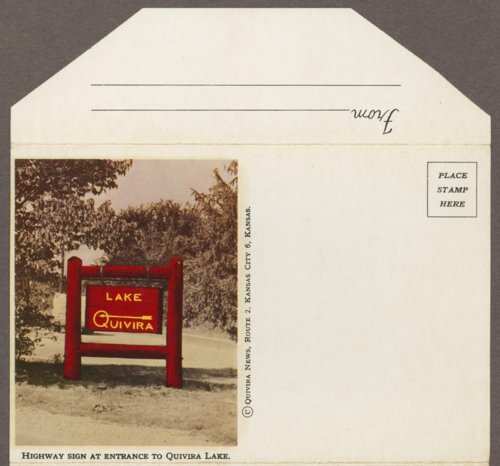 Here are four postcards and the envelope in which they were distributes of Lake Quivira, Kansas. They were distributed as a packet and the envelope has printed information about Lade Quivira. The images include the highway sign at the entrance to Lake Quivira, the Crescent Beach board walk and diving tower, a typical ome at the west end of the dam, the golf course, and the golf club house. Lake Quivira had 900 acres of restricted residentail and recreational property.